PURE Motorsport, LLC is committed to providing a safe and secure shopping experience for all of our customers. We designed PURE Motorsport, LLC to accept orders only from Web browsers that permit communication through High-grade Encryption (AES-256 256 bit) Secure Socket Layer (SSL) technology, including Netscape Navigator 3.0 or higher, or Internet Explorer 3.02 or higher. This means you'll be unable to inadvertently place an order through an unsecured connection. Is my credit card number and personal information secure? What does High Grade encryption mean? What does the "warning" window that sometimes comes up really mean? Which parts of the PURE Motorsport, LLC site are secure? We have taken many steps to ensure the security of your transactions. Some of them involve adopting industry standards. (For example, the secure connection between your browser and sensitive portions of our site uses industry standard High-grade Encryption.) Our aim is to enable you to make transactions with confidence. WHAT DOES HIGH-GRADE ENCRYPTION MEAN? PURE Motorsport, LLC provides you with High-grade Encryption (AES-256 256 bit), the highest level of protection possible for all your Internet communications, including credit card use and financial transactions. Encryption makes it difficult for unauthorized people to view information traveling between computers. WHAT DOES THE "SECURITY WARNING" WINDOW THAT SOMETIMES POPS UP REALLY MEAN? On some browsers, this window can be a bit intimidating. But it simply means that you're entering the safest, most secure area of our Web site. This should be reassuring since this is where credit card transactions take place. Click on the "Continue" button to move to the next step. Going from Secure mode to insecure mode, you'll likely receive another similar alert message, just to make sure you know what's happening. If you don't want to see these alerts (a personal security choice for you to decide), then you may click to de-check the "Show This Alert Next Time" box. WHY DO I HEAR SO MUCH ABOUT WEB SECURITY ON THE INTERNET? There are several reasons that Internet security is a newsworthy item. First, it's relatively new, so people wonder and talk and write about it. Secondly, the Internet is "technology", so people find it interesting to discuss and tend to be a little suspicious of it. The Internet thrives on openness. It has been the "Internet way" for someone to release something-a piece of software, a networking specification, a security protocol-and then have lots of smart people try to find flaws in it, lending their ideas for making it better. It has proven to be a remarkably effective development process. But for people unfamiliar with it, this can be rather discerning. For this reason, we have provided this guide to your security concerns to help you understand and feel comfortable with your online purchases. Data you send is strongly encrypted. The site you're doing business with processes your credit card and address information in a safe and responsible manner. Many security experts say the most important thing is what happens once the merchant receives your order. At PURE Motorsport, LLC, we take several steps to keep things on our end as safe as possible. Most of the activity on our site involves the viewing of materials we've prepared and made accessible to everyone, so there's no need for these pages to be "secure". With a product page or an editorial page for example, no security risk exists because there is no "information" being exchanged. Anyone can access the same pages by pointing their browser to https://www.purems.com. The portion of the PURE Motorsport, LLC site we've made secure is, not surprisingly, the checkout area. This is where you actually purchase the items you've put into your Shopping Cart. The entire checkout process, from introduction to final confirmation, takes place in a secure environment. There are several ways to confirm that you're in a secure area. All SSL capable browsers have a symbol to indicate secure mode. Typically you will see either a broken or complete key, an open or closed lock or simply a closed lock depending on your particular browser. The complete key and closed lock symbols indicate that you are in a secure area of the web site. 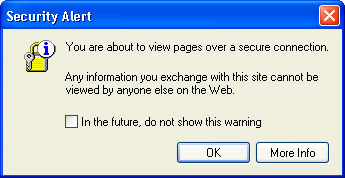 One additional note: some browsers give you a warning when you go from a secure area to a regular area. Their intentions are admirable- to ensure that you know when they've left a secure server. But to you, the message may be a bit startling, and makes it look like you've done something wrong even though you really haven't. If you should have any questions or concerns, please contact us at info@purems.com.